It's been a very productive season for Phillies prospect Damek Tomscha (pronounced like DAME-eck TOM-shay), who has posted a .304 batting average with 11 homers and 52 RBI in 106 combined at two levels with the Class A Advanced Clearwater Threshers and the Double-A Reading Fightins. Tomscha, who was the Phillies' 17th round draft selection in 2014 out of Auburn, has split time on defense, playing third base, first base and taking on left field this year in order to stick in the daily lineup. This weekend I spoke with Damek, a 26-year-old righty batter, about his successful campaign this year, how is compares to last year when he struggles in Clearwater, the depth of the Phils' developmental ranks, a surprising rivalry in minor leagues and plenty more. Read ahead for that full interview. -You've had a solid season overall. Putting up good numbers at two levels and making it to Double-A for the last quarter or third of the season. What are your thoughts on your 2017? Yeah, I mean I feel like I obviously was successful at the plate. I mean, I did what I think I had to do throughout the season to be consistent and put up the numbers I needed to put up and be a consistent guy for each team that I got to play with. So, I'm happy with how it's going and I'm looking forward to see what will happen next. -In 2016 you started the year with Lakewood and took a step up to Clearwater, but didn't enjoy success there at that time. You ended up taking a step back to Lakewood last season. What was the difference for you this year to have success there and avoid hurdles that can come with promotions? I think it's just how you approach the game. I was taking it one (at bat) by one (at bat) and each game by each game and not trying to look too forward with what you can't control, and that's where you play, and I feel like I did a good job with going out there and playing and trying to get a hit every time, doing whatever you can for the team and, you know, I think that was the main reason for the success this year. -You added some positional versatility this year, playing outfield more and more. Does that come with some challenges or is that something you are prepared ready for? I just think it's good-- playing three different positions puts more value to you. I mean, it's a little tough. You want to get your ground balls. I'm a guy that likes getting the ground balls at third base and feel comfortable. And it takes a little time. Going out to the outfield, obviously, it's a little different. Haven't played that-- I mean, I played a little bit last year, but before that Little League. (Laughs) I'm glad I was able to make myself more valuable as a player. -I've talked to other guys that have made positional switches, and they'll credit the coaching staff, like Andy Abad, with taking strides to improve defensively. Was that the case for you, or was there someone else who helped a lot with the transition? Honestly, they haven't really said a whole lot to me. Last year I played (out there) a little bit, but you know they were kind of like, "Hey, just go play." I mean, I feel like I'm a good enough athlete they can just stick me out there and not embarrass myself too much out there. I think they're comfortable with me being out there and I'm the same too. I'm comfortable playing left field. -Cool. Have you noticed any similarities to the Florida State League and the Eastern League or is there a noticeable learning curve or adjustment period when you come up here? Sometimes with just pitch sequencing or maybe getting ahead in counts and seeing more fastballs in the Florida State League. The main thing with me I started off kind of slow, just being anxious and with confidence of just, alright, "You're ready to play. Just go out there and do what you do. As long as you keep hitting, you'll have a spot." I feel like the biggest thing was just adjusting to some of the pitches. -I have heard also that there's some adjusting to be done with the umpires when you move up levels. Do you find that to be true as well? Yeah, I mean I feel like the zone's definitely a little bit smaller and I feel like that helps us. You know, you're still going to-- obviously, you have to cover a little bit more in the Florida State League and obviously in low-A. You know, to be able to not have to cover as much makes hitting a little bit easier. So, that's always kind of nice. -There a lot of buzz about the prospects in the Phils organization with players moving up, a lot of names being exciting or buzz worthy. It's gotten tough of late to rank guys and acknowledge some guys along with that. What is it like to be in this system right now, a system where a pitcher like Jose Taveras can dominate every level and barely get recognized and a system where Mitch Walding mashes and shows a lot of power and doesn't get very much attention because there's so much depth and so many other names garnering hype? It's obviously great for the Phillies. There's a lot of competition, so you've got to go out there and play as well as you can. I feel like it's fun. I mean, it's such a competitive business, but we have a great group of guys here and I know a lot of us follow what everyone else is doing in ths system and we root for each other, because we know if it's not (with) the Phillies we may have an opportunity with someone else. So, the friendships that you build here are great, so it's definitely fun to see guys have success, like (Scott) Kingery doing what he did. He roomed with me in Lakewood. 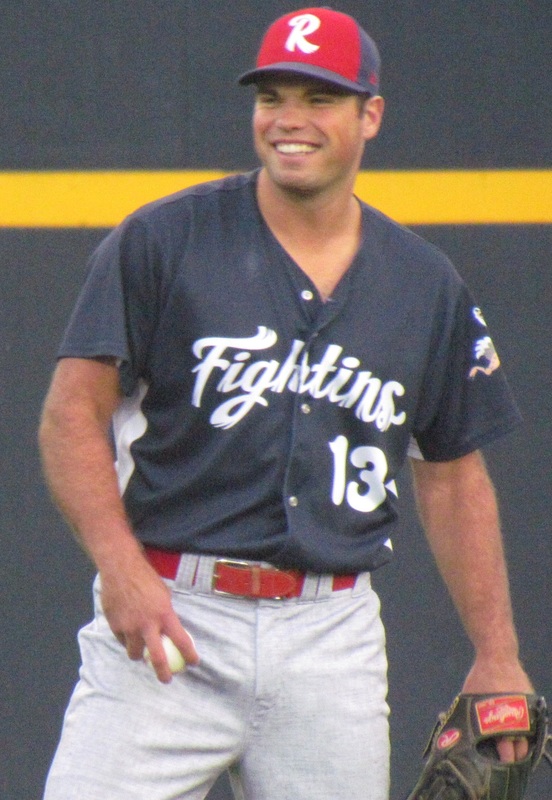 You know, other guys like (Rhys) Hoskins too. So, I mean it's fun I think overall, as a system. -So, there's no trouble-- with all the competition, there's no trouble getting excited for other guys' success, because they're still your friends. Oh, yeah. None at all really. We all just like going out, having a good time, playing relaxed. When other guys get promoted, they're happy for each other and all you can control is how you play. So if you play well, maybe someone else will pick you up. You know, the Phillies might move you up too. You just have to be happy for the guys and keep doing what you need to do to get better. -Let me wrap up with you and ask you about the guys on the other side of the field. Throughout the season I've asked some guys about a rivalry between the Phillies and Yankees in the minor leagues, with a lot of competition between the organizations at each level all the way down to short-season and rookie ball. Do you notice that there's a budding rivalry? I mean, maybe a little bit, because down in (Florida), you play them in spring training, you play them in every league. Obviously, there's some. I wouldn't say it's a hatred rivalry like you get maybe with the Pirates. It's pretty well known throughout the system that we don't really like the Pirates. Yeah, so I feel like that's more so than (a rivalry) with the Yankees. I think a lot of us have some pretty good friends over in the Yankees organization, so it's just fun to play them. They have a great organization too, so when you get two top organizations going at it, it should be good ballgames. -I'm not asking you to dish dirt, but share with me more about this Pirates-Phillies rivalry. What can you tell me about this Keystone State rivalry in the minors? I'm from the midwest, but I feel like that already should be known. I feel like, just that's what we've kind of been taught. We play hard and they play hard. When you have two teams that are playing the game the right way, then you're going to have some heated rivalries and that's what we have more of in the minors down here at least.